The Bird Park is a part of an area called the Lake Gardens. These serene and scenic Lake Gardens (60-hectare) were established in the year1888 and form the green belt of Kuala Lumpur. The lake is an artificial lake. Visitors can take a leisurely boat cruise to enjoy views of the gardens from the water. Visitors will enjoy strolling through the park along a maze of walkways, amidst greenery. Scenic rest stops for picnics are scattered throughout the park. There is a children's playground, jogging tracks, exercise stations, and rowing boats. The gardens incorporate the National Monument, Butterfly House, Bird Park, Orchid and Hibiscus gardens, with the former Malaysia�s Parliament House situated at the northern end. Nowadays the Parliament is situated in Putrajaya <click>. 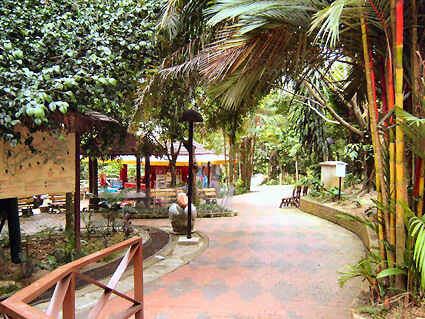 The KL Bird Park was established in 1991 and was officially opened by Her Majesty the Queen of Malaysia, Tunku Bainun. The park is 10 minutes away from the city centre. 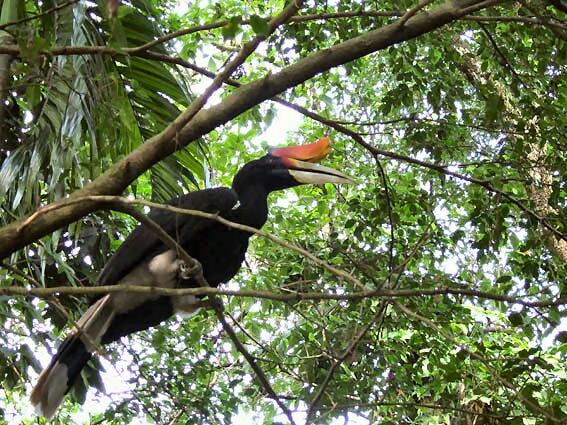 The park offers you a great opportunity to see a hornbill in the first days of your stay in Kuala Lumpur. The Bird Park is "The World's Largest Covered Bird Park" or "The World's largest Free Flight Aviary". Opposite the Bird Park the Taman Orchid (the Orchid Garden). This is also worth a visit. They have a lot of different orchids. A taxi from the city centre to the Bird Park will cost you RM15.- On your way back you have to buy a ticket at a taxi counter. 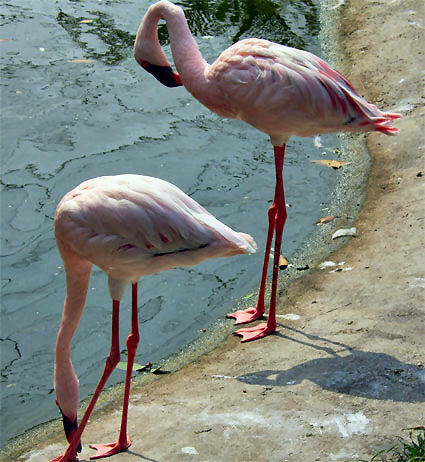 The Bird Park houses more than 3,000 birds and 200 species from all over the world. Birds and nature lovers can have a wonderful day watching colourful sights and melodic sound of birds perching and winging about freely while enjoying the natural and beautifully landscaped surroundings. Sometimes you'll be surprised to come across miniature gardens, pools and water cascades, bridges, flowering plants ...and bird - feeding stations. The park looks a bit old fashioned, but it's cosy and the people are very friendly. After you have bought ticket at the main entrance, you'll get a wristlet. When you go back to town they will take it off. Foreigners pay more for a ticket than Malaysians. The park is divided in several zones (4) to prevent chasing at each other. You'll find in the park, a Flamingo pond, Pelicans, Hornbill Park. World of Parrots, a Waterfall Aviary, Amphitheatre, Children's playground and Seminar Room. To prevent that the birds can get together, you have to go through several lock-gates. You can enjoy the natural and the beautifully landscaped surroundings. 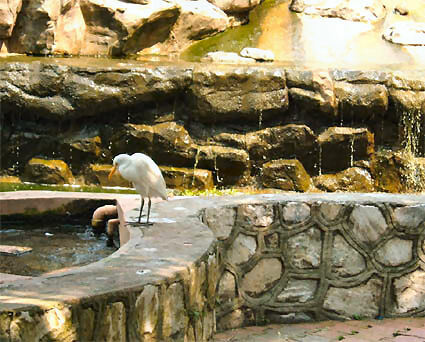 One of the KL Bird Park's extraordinary feature is all birds let free in the aviary which resemble the natural habit. With this type of free flight concept. birds are able to breed naturally in this unique concept bird park. It's a lovely to see the hornbills flying so free from tree till tree. As some bird have sharp bills and claws, they can bite hard without warning. So please do not disturb or frighten the birds. The hornbills are really photogenic. They are not so frightened and will (mostly) wait till you have taken a picture. This is the highlight of the park. But remember: these bird are wild birds! There's a refreshment kiosk, where you can buy an ice-cream, a drink or food for the goldfish in the pond. Bird's diets are special. Wrong types of food may cause food poisoning. You may only feed the fish in the pond. Near the Hornbills is the Hornbill Souvenirs Shop and the Hornbill Restaurant & Caf�. It's located on the top of a hill and you have spectacular view. From the terrace you can see the hornbills flying. Flamingos, Hornbills, Waterhens, Parrots, Cockatoos, Storks, Pheasants, Mynahs Pigeons, Macaws. Ducks. Malaysia, Australia, Africa, Papua New Guinea, Thailand, Indonesia, Tanzania, China, Holland, South America and other countries in South East Asia. All activities are subject to changes and weather conditions. Opening hours of the park: 9.00 - 19.00 hours.